Warrior woman loses the battle (★★ Directed by Robert Schwentke. With so few female-lead action films around, and having been pleasantly surprised by the first film in the series, I looked forward to Insurgent, part 2 of the Divergent trilogy, with some anticipation. Sadly – because it’s always sad when potential is squandered – this sophomore effort is more slump than pump, and does not live up to the first. The story picks up with Tris (Woodley), her brother Caleb (Ansel Elgort), lover Four (Theo James), and spiky Peter (Miles Teller) hiding out in Amity, the section of their factioned off society where peace, love and harmony reigns. Four, tired of the battle and hiding some embarrassing secrets, is happy to lay low. But Tris is itching to strike back at the brainy Erudite faction and it’s power-mad leader Jeanine (Kate Winslet), who she blames for the death of her mother, and whom she is determined to kill at any cost. 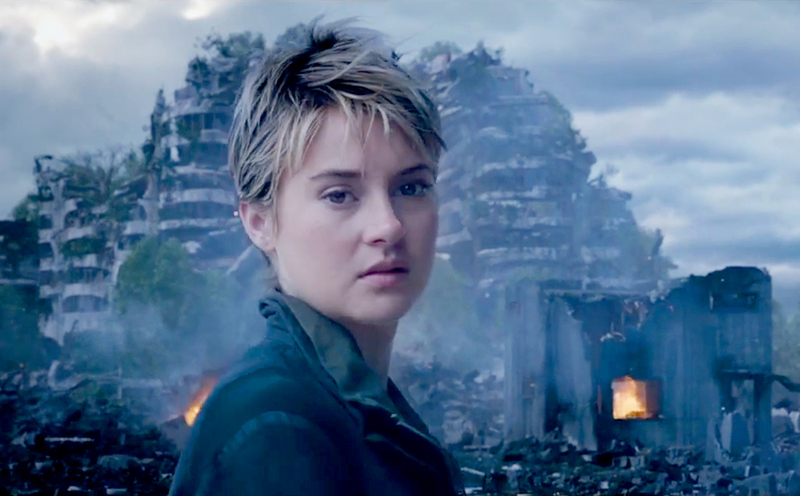 Always on the boil, Tris’s barely contained temper puts her at odds with gentle natured Amity, and soon the four are forced to leave. But not before Jeanine attacks Amity in her hunt for Divergents, social outliers she despises but who can open a box left by the Founders that contains a secret message. Peter, ever the brat, dobs Tris and her boys in rather than go on the run with them, and the trio have to bust out of Amity. Along they way they’re attacked by the Factionless, a wild band of exiles and misfits and taken to their leader, Evelyn (Naomi Watts). The trio forge a tentative, if volatile, alliance with her in order to bring down Jeanine and reveal the ancient secret that will decide the future of all the factions. Devoid of all subtlety, Insurgent often feels like a story told by teenagers about why everyone over 25 is just plain wrong. That naivete serves to make the moments of moral dubiousness in the film all the more startling. There’s no shying away from viciousness, violence or straight up murdering of folks here. But it’s often done with no clear purpose. The worst aspect of Insurgent, however, is that it hinges on a mythical, mystical, message bearing chotchka, left behind by some mythical, mystical Founders. I’m sure this idea plays better in the original books, but in cinema if you’re resorting to plot devices that are actually, you know, devices, you’re really scraping the bottom of the ideas barrel. It’s a pity, because Insurgent’s post apocalyptic Chicago is stunning and its cast is strong. But not even sturdy performances from the reliable Woodley, or Oscar tinted Teller, Winslet and Watts, clearly enjoying her role as the prickly pirate queen, can bring the world to life or salvage this muddled, awkward film.